Highlander’s co-worker, Luchie A., has invited us to her house in the Gulf Coast of Texas to pick calamansi from the tree in her backyard. We have gathered grocery bags full of the fruit for ourselves and for friends. We typically squeeze all the little Philippine limes to make delicious fresh squeezed fruit juice. 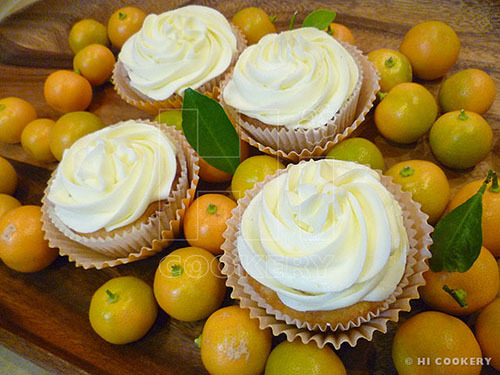 We also reserve a bit of the liquid to make calamansi cupcakes for Luchie and the other co-workers. The cupcakes are always a big hit with everyone in Highlander’s office. National Cupcake Day occurs during the holiday season when cookies are frequently exchanged. But cupcakes are a sweet choice to share, too. If calamansi juice is available, use it to make this terrific and tart treat. In a large mixing bowl, cream the butter with the sugar. Beat in the eggs. Stir in the vanilla. Pour in the calamansi juice. In a separate bowl, combine the flour and baking powder. 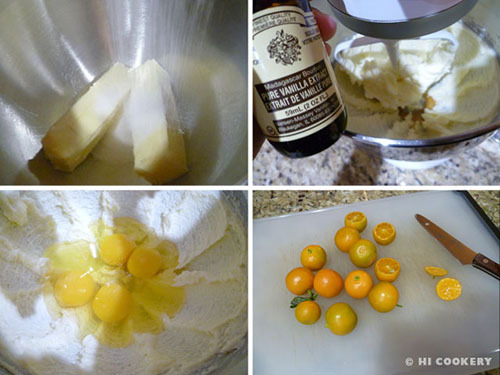 Add this mixture gradually to the other ingredients. Blend until the batter is smooth (it will be thick). 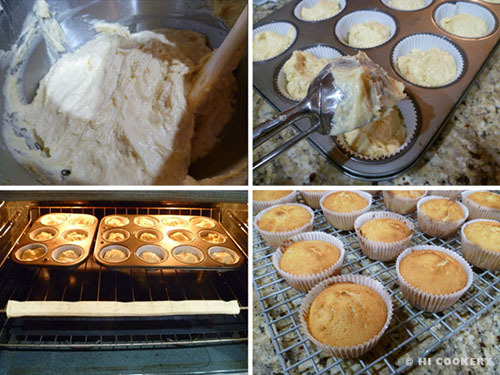 Scoop into cupcake papers and place in muffin tins. Bake in a preheated oven at 350 degrees F for 20 minutes or until done. Remove from the oven and transfer to a wire rack to cool completely before frosting the calamansi cupcakes. In a large bowl, cream the butter with the vanilla. Gradually add the powdered sugar. Thin to a spreadable consistency with the calamansi juice. 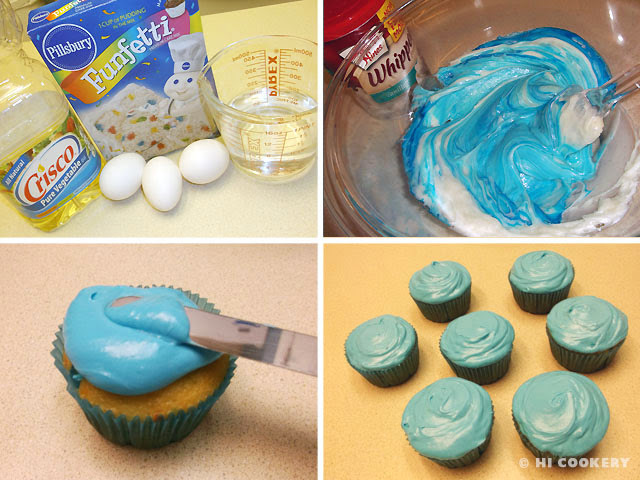 Use Wilton tip 1M in a piping bag and decorate the top of each cupcake with swirls. Squeeze more juice from many calamansi fruits for a refreshingly tart drink. See our easy recipe for calamansi juice for National Fresh Squeezed Juice Day on January 15. Maraming salamat (thank you very much in Pilipino/Tagalog) to Luchie A. for the calamansi! When our Ukrainian friend Olga W. got married in 2004, we gifted her groom with a cake. The flavor requested was a Black Russian chocolate cake because 1) they are chocoholics and 2) the flavor gives tribute to Olga’s culture. The Black Russian cocktail is made with vodka and coffee liqueur (which gives the drink a dark color) and served over ice. The cake also contains both spirits for a doubly delightful dessert. Instead of a groom’s cake, we made them into mini-sizes for our blog post for National Cupcake Day. Bake Black Russian cupcakes and enjoy! Na zdorovie! In a mixing bowl, combine the yellow cake mix and chocolate instant pudding mix. Stir in the oil and water. 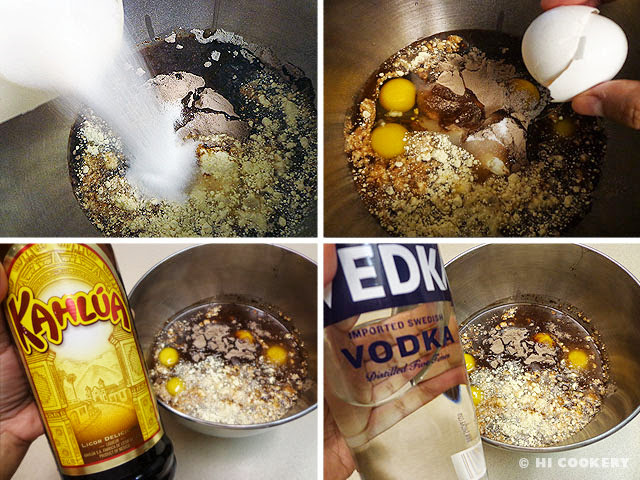 Add the sugar, eggs, coffee liqueur and vodka. Blend well. 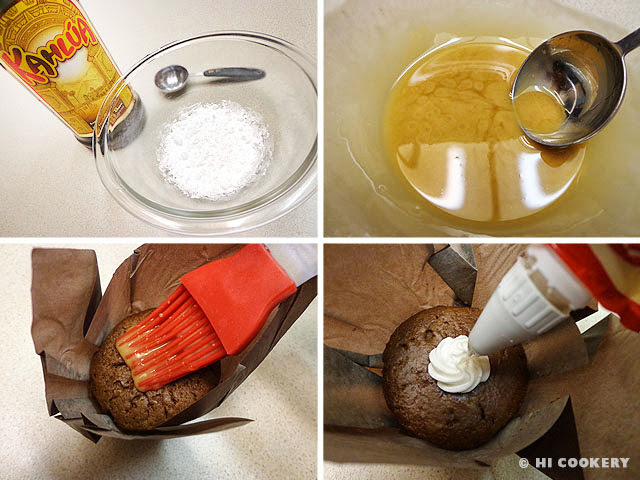 Scoop the batter into cupcake papers lining muffin tins. Bake in a preheated oven at 325 degrees F for 30-35 minutes, testing for doneness with a toothpick. Remove from the oven and transfer the cupcakes to wire racks to cool completely. Yield: Approximately 2 ½ dozen cupcakes. In a small bowl, combine the powdered sugar with the coffee liqueur. Mix until smooth. 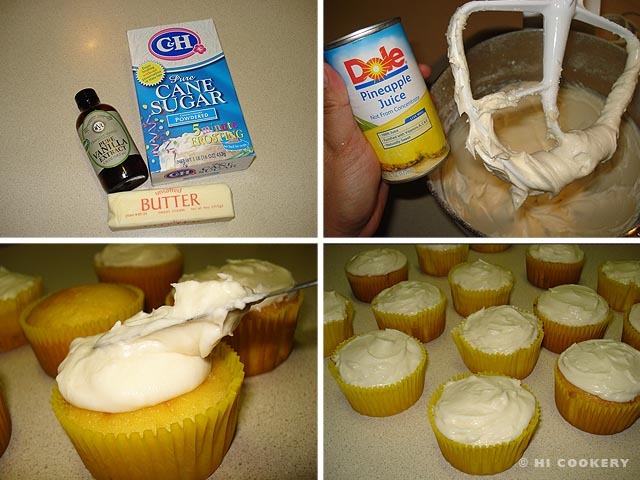 Generously brush the tops of the cooled cupcakes with the glaze. 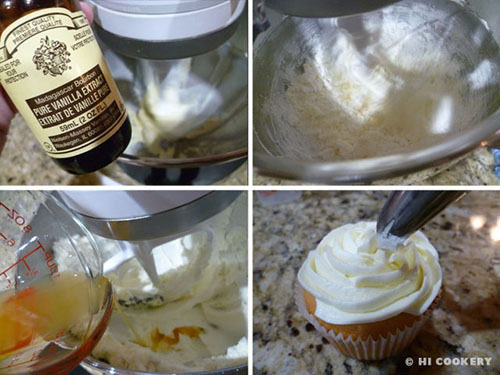 Pipe white/vanilla frosting or whipped cream in the middle of the cupcakes. Top with a chocolate-covered coffee bean. Serve at room temperature. 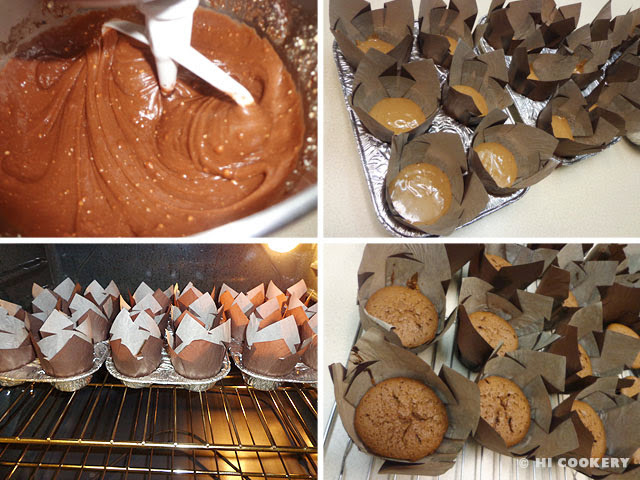 We used brown “tulip” cupcake papers for this blog recipe post. Check local craft stores and bakery supply shops for an assortment of choices of cupcake paper styles (regular, mini, jumbo, “tulip”, scalloped, ruffled, foil, colored, patterned, etc.). Search our blog post for more cupcake recipes. 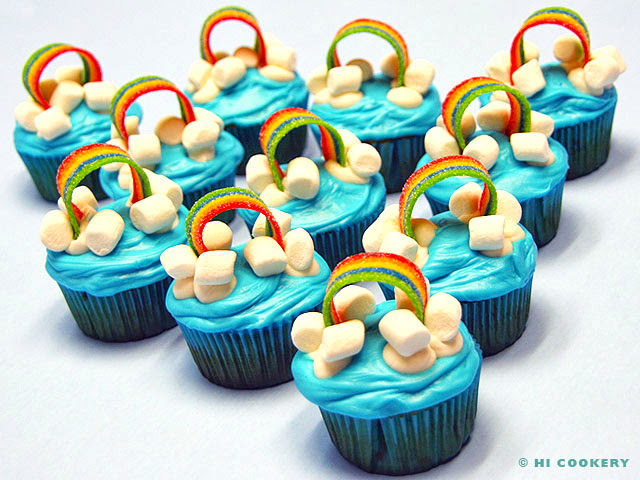 Somewhere over the rainbow—and maybe somewhere closer—rainbow cupcakes are making people smile! Who could resist the colorful confetti in the cake batter, the bright blue sky frosting, the fluffy marshmallow clouds and the sweet-sour strips of chewy candy? We made these rainbow cupcakes for a “Wizard of Oz” themed party and they surely made everyone smile! Some people did not even want to eat them because these Technicolor treats looked so cute. 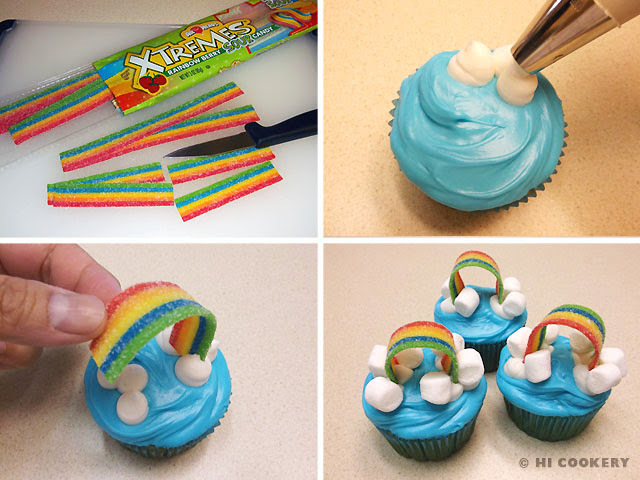 For National Cupcake Day, decorate something over the top and over the rainbow and make rainbow cupcakes! Bake cupcakes as directed on the box package. Cool completely. Frost the tops with blue frosting. Cut the rainbow candy strips in half. Use the white tube frosting to pipe some clouds to secure the strip and marshmallows. Arch the rainbow candy strip into the white frosting. 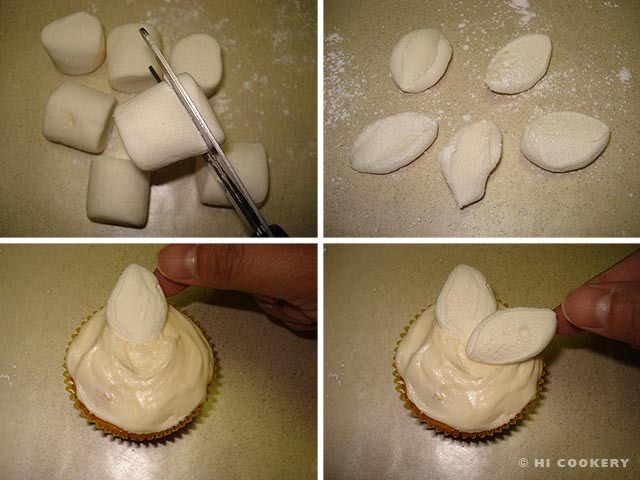 Complete the cupcakes by hiding the edges of the strip with mini marshmallows. February 25 is National Cupcake Day in Canada. It is celebrated as a fundraising event to benefit animal shelters and humane societies. Search our blog for other cupcake recipes and decorating ideas. In elementary school on the mainland*, when Islander was learning about ethnic diversity, her teacher asked parents to share a simple snack from their kids’ cultures. Mommy brought puto, a type of Filipino cake made with rice flour. However, some people were not used to the glutinous texture of traditional puto. So she used a more familiar flour—Bisquick brand baking and pancake mix—to Americanize this Filipino food. The mini-sized puto proved popular in class! 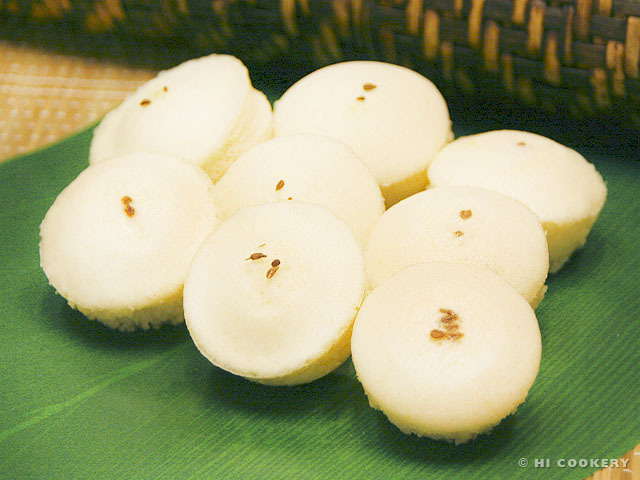 Occasionally Islander still prepares puto with Bisquick on the mainland but eats the traditional rice cupcakes whenever she is in Hawaii or the Philippines. 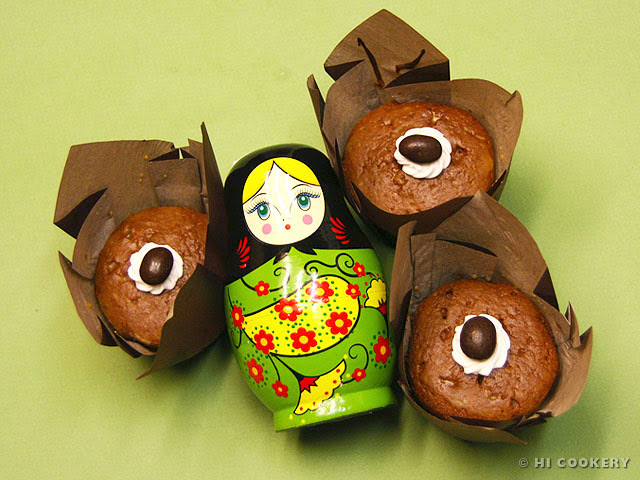 Make them in mini-muffin pans for a cute cultural cupcake for National Cupcake Day. 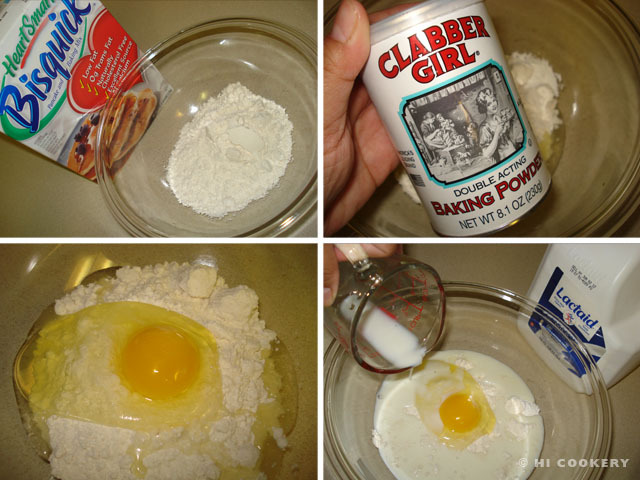 In a large mixing bowl, combine the Bisquick and baking powder. Add the egg. Stir in the milk. Add the sugar. Mix well to make a smooth batter. 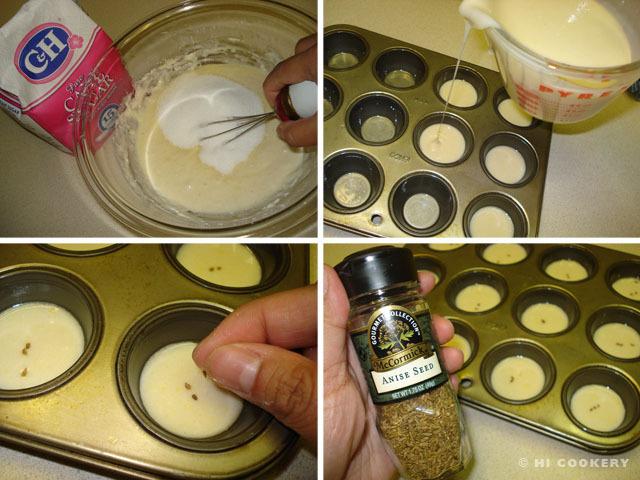 In a greased mini-muffin pan, pour the batter no more than halfway full. Sprinkle 2-3 anise seeds in the center of each puto. 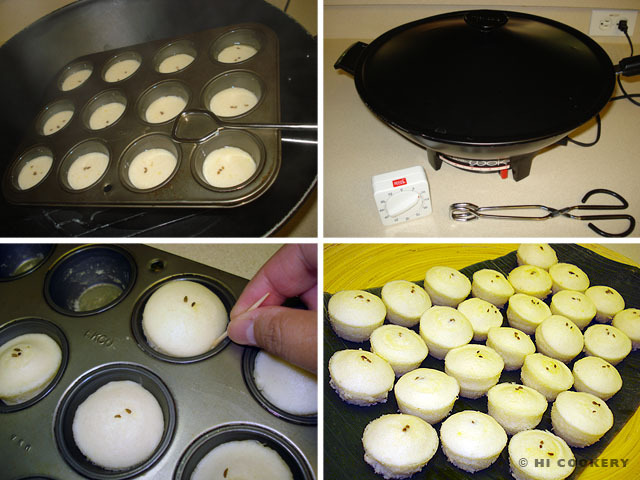 Place the mini-muffin pan in a steamer. Steam for 10-15 minutes. Carefully remove from the steamer and let cool in the pan for 10 minutes. Continue steaming the other pans. Remove each puto with a toothpick. Serve on a platter lined with a banana leaf (optional). Yield: Approximately 2 ½ – 3 dozen mini puto. We used a wok with a wire platform to steam our puto. Heat the wok with about an inch-deep of water. Place the mini-muffin pan in the wok. Steam for 10-15 minutes. Remove the pan with tongs, being careful of escaping heat. Keep checking that the water does not evaporate. Pour more as necessary. Sometimes we would add a few drops of liquid food coloring to create pretty pastel shades of puto. Divide the batter into three or four bowls and tint with food color for a fun and festive presentation of puto. Puto Bisquick is best eaten immediately or on the day it was made. Store any leftovers in a tightly-covered container. *Back in the late 1970s, Islander and Brenda J. were the only Asian and Hispanic students among black and white classmates in their Virginia elementary school. Brenda’s mom brought mini tacos. Ironically, decades later, we now live in the same South Texas town and still talk about the time when our moms came to class with food for ethnic diversity day! Aloha! We have combined two island icons, pineapples and plumerias, to create a tasty tropical treat. Pineapples are a symbol of Hawaiian hospitality and fragrant frangipani flowers are often made into leis. We baked a basic pineapple-flavored cake and topped them with marshmallows cut as plumeria petals. These edible, brightly-colored blossoms look like the real things from afar! 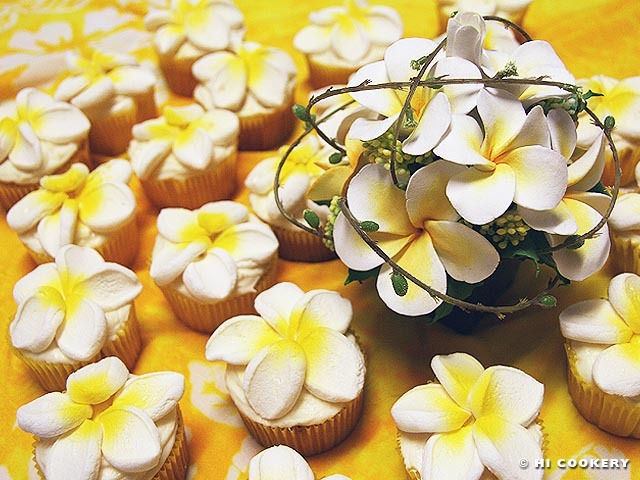 Make pineapple-plumeria cupcakes for a kitschy kanikapila or luau, for a warm welcome to the winter season (especially on the mainland) and for a celebration of National Cupcake Day. 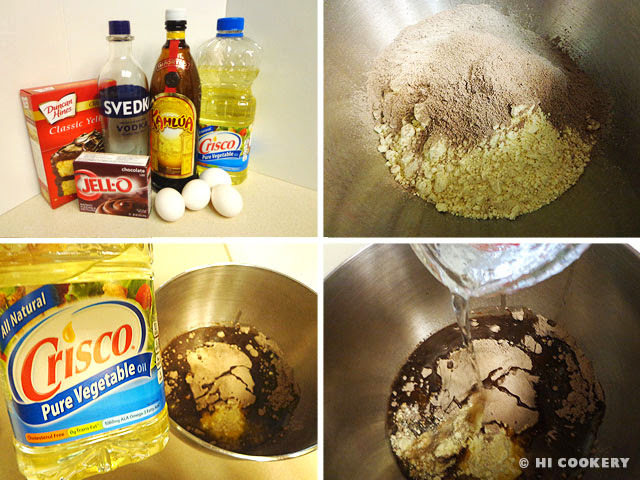 In a mixing bowl, combine the cake mix, juice, water, oil and eggs. Blend until the batter is smooth. 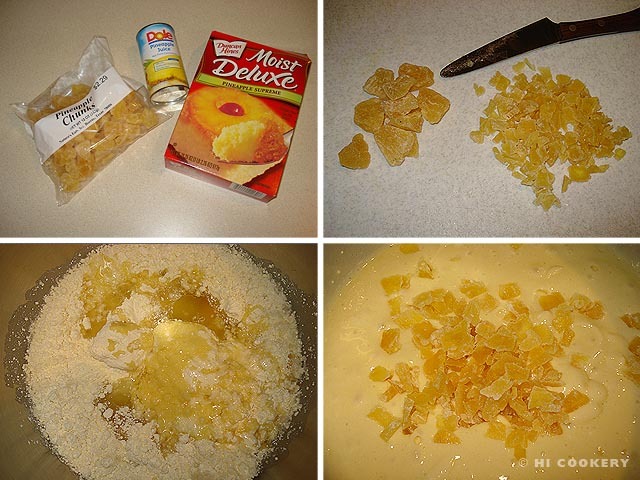 If using dried/candied pineapple, add to the batter and mix well. 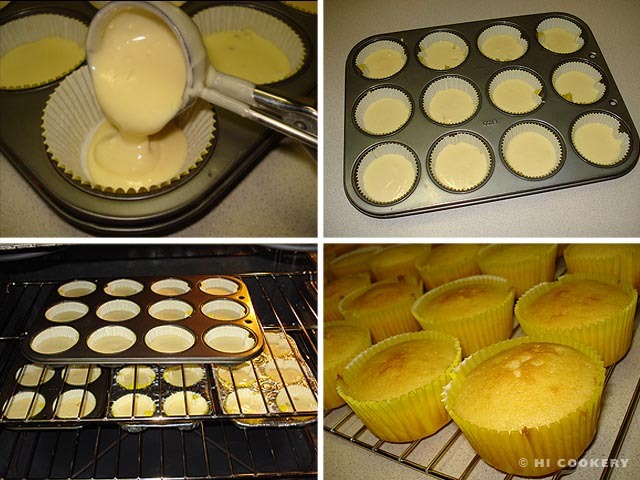 Scoop the batter into muffin tins lined with cupcake papers. Bake in a preheated oven at 350 degrees F for 18-20 minutes. Remove from the oven and transfer to a wire rack to cool. Yield about 2 ½ dozen cupcakes. Cream the butter with the vanilla until smooth. Gradually add the sugar and mix well. Add the pineapple juice to thin the frosting to a spreadable consistency. Frost the tops of the cupcakes. Make sure that the work surface and kitchen scissors are clean and dry. Lay waxed paper down and sprinkle a bit of powdered sugar to prevent stickiness. Cut four times through a marshmallow to create five petals. Arrange on top of the frosted cupcake. 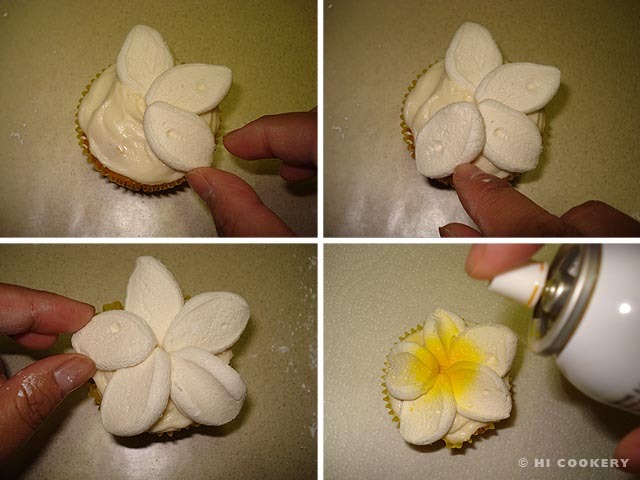 Carefully spray the food color in the center of the plumeria. Store covered at room temperature until ready to serve. Plumeria is commonly called frangipani outside of the United States. The flower is not to be confused with the food-based Italian frangipani (almond cream filling) or French frangipane (pastry batter). 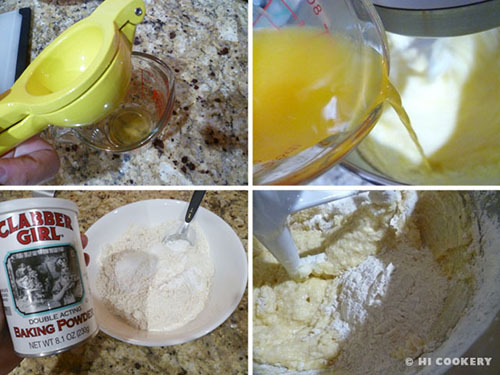 If a pineapple flavor cake mix is unavailable, use a yellow cake mix and substitute pineapple juice for the water. Thanks to Lisa L. for the vanilla extract from the Big Island. Thanks to Ninang Rosario C. for the handcrafted clay frangipani bouquet. It was a realistic reference point for the picture of the plumeria marshmallows.